Fonds consists of 5 boxes of materials related to the BC Provincial Police, including bound volumes of "Shoulder Strap," "Off Patrol" newsletters, General Orders 1923-1950, Constable Correspondence 1904-1909, and Criminal Investigation Branch Vol. 1-14. Some restrictions apply--see archivist for details. 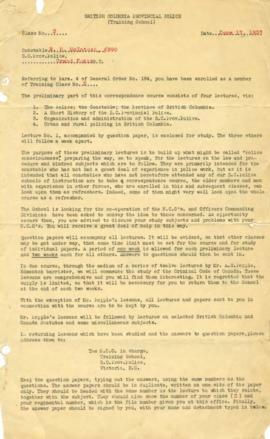 Associated materials exist in BC Archives' Provincial Police fonds. The 28 volumes of "Shoulder Strap" range in date of publication from 1938 (vol.1) to 1956 (vol.28). This semi-annual publication was issued by the Authority of the British Columbia Provincial Police.